Well, we finally managed to comb through all of the submissions. We finalized our list and culled it down to “only” 34 stories. 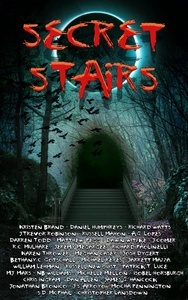 And now I’m thrilled to tell you all that not only is Secret Stairs – A Tribute to Urban Legend now available, but it’s also the #1 New Release in horror anthologies! You can get the Kindle edition on Amazon for only $0.99 if you buy it by this Saturday. The paperback edition clocked in at $24.99 because this turned into a beast at 668 pages. I absolutely loved A Place Outside The Wild, Daniel Humphreys‘ Dragon Award nominated debut novel, even though I don’t normally go for zombies. 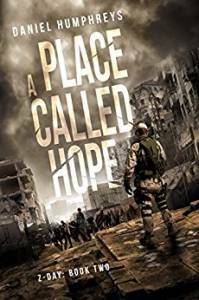 So when Mr. Humphreys offered me an early preview copy of the sequel, A Place Called Hope, I absolutely jumped at the chance. This story picks up very closely where the first book left off, and it hits the ground running. The primary story concerns Pete, the amputee Marine, and Charlie as they set off on a new mission to bring some real Hope into their world. 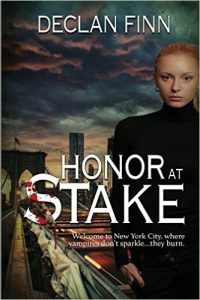 The stakes are high and compelling, and the characters are just as fun as ever. The story focuses more heavily on the Marines this time out. On the one hand, that was really fun. On the other, it leads to my two actual complaints about the book. First, the title is excellent and a wonderful followup given the ending of the first book. But despite the title, very little of the book actually takes place in Hope. Second, I really missed Miles. I strongly suspect the sequel will deal with both of those issues, however – especially given some of the revelations at the end of this book. And boy, are there some doozies! 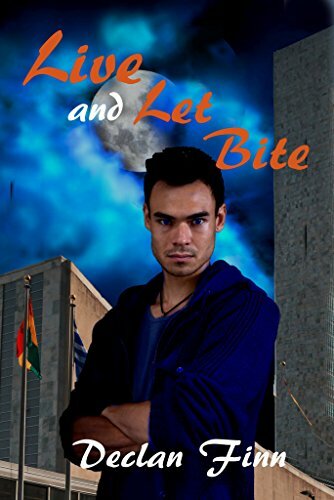 If you loved the first book, this worthy sequel won’t let you down. I give it five out of five stars, and I can’t wait to see what Humphreys has coming next! Dear readers, several of you have signed up to be alpha readers for my upcoming novel, Post Traumatic Stress. I am sorry to say that the second draft is not yet ready. I promise that I will put it into your hands as soon as possible. There are several reasons it isn’t ready yet. One is that my editor, the esteemed Mrs. L. Jagi Lamplighter Wright, has been busy finishing up a prior commitment. The good news is that she is now finished with that commitment. 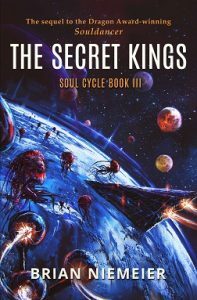 The better news is that as a result of that, today my friend Brian Niemeier has released the third book in his Campbell Award nominated and Dragon Award winning series, “The Soul Cycle.” Book three, The Secret Kings, is available today for Kindle. Alas, I have not yet read this book and so cannot offer a full review of it yet. The reasons for that are the same as the other reasons that I have not yet finished the second draft of Post Traumatic Stress. Please do not think that it is Mrs. Wright’s fault nor Mr. Neimeier’s fault. Indeed, I have been tremendously busy for the last six weeks or so. On top of that, I’ve spent roughly two of those weeks out of town – first attending a memorial for my late grandmother and then later on a rare and much needed family vacation. On top of all that, I’ve also been quite sick, first with about three weeks of bronchitis and now with a rather rough cold. Finally, I encouraged Mrs. Wright to finish Brian’s work first – both because adhering to prior commitments is the right thing to do and also because Brian marches to much tighter writing and publishing deadlines than I do. For all that, I offer my deep apologies to Brian for not having a review ready. I plan to remedy that before the month is out. Furthermore, I now have a very rich collection of excellent notes from Mrs. Wright and from my own wife on Post Traumatic Stress. I’m rather happy with the first draft, but I can assure you that the second draft will be far better as a result of her input and will be worth the wait. In the meanwhile, I suggest that you pick up a copy of The Secret Kings. Or, if you’re unfamiliar with the series, start at the beginning with Nethereal and its Dragon Award winning sequel, Souldancer. The round one entries are up (Brian’s, Declan’s), and they are both fantastic! Both authors lived up to the primary task of the challenge: making it awesome. Mr. Niemeier gets points for zen. Astlin handled the Gelatinous Cube with poise and grace, and almost without noticing it. Mr. Finn, as before, scores for lots of guns and explosions, as well as tying the scenario in to Amanda’s backstory. As with round 1, round 2 was difficult to judge. In the end, however, this round must go to Mr. Finn – as Amanda was the only character to actually defeat the Gelatinous Cube, rather than ignore it. Sadly, Mr. Niemeier has had to bow out of future rounds due to scheduling issues. Therefore, we leave this challenge the way we began: in a draw. Except that this draw is really a win for us, the readers, because both authors have provided us with excellent reading material. 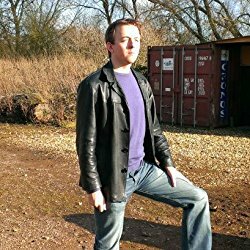 Declan Finn is the author of the Pius Man Trilogy as well as the Dragon Award nominated Honor at Stake. 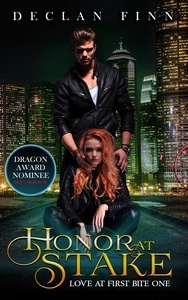 He graciously agreed to enter this Author Gladiatorial Challenge to earn your vote for the Dragon Awards. The awards are over, but the fun continues! You can find his entry for round one here. Below is his entry for round two. I hope you find it as entertaining as I did. Brian’s entry ran earlier this evening. Judging comes tomorrow. Amanda looked up at the giant blob, and decided that she seriously hated whoever put her hip deep in this insanity. She looked behind her to the room she woke up in, then back to the blob. And she smiled. The door was made of metal, and the blob apparently didn’t digest metal, especially if that stop sign was anything to go by. This will at least slow it down. She reached over, grabbed the door, and ripped it off of its hinges, and flung it at the blob like a hatchet. The impact sent ripples throughout the creature, and … that was it. Amanda turned and ran back into the other room. She thrust her fingers into the wall, grabbing and pulling out a chunk of rock from the wall. She hurled it at the blob, and kept digging through the wall, creating a tunnel that was about a lady’s size six, going straight into it, expecting the blob to follow her. Had Amanda had the time, she would have sighed. She had survived most of the idiotic decisions of the Vietnam war fighting creatures in the vast network of tunnels, and she swore she would stay out of them for the rest of her life. Now, here she was, digging another tunnel. Amanda growled, annoyed at the thought of the war. She had been a veteran of five wars – six if you counted the Cold War – and she almost preferred World War II to Vietnam. Amanda thought that over as she shoved more dirt and rock behind her. Okay, she shouldn’t really think that. Sixty thousand dead in all of Vietnam, while that was the cost of a single engagement in World War II. But God was that war run by idiots. Miles of tunnels throughout the country, crawling with VC and monsters like her, and they could have just been wiped out by bombing some dams and flooding the tunnels. What was the matter with those people? Heck, why didn’t she eat MacNamara again? Oh, right, eating someone for stupidity wouldn’t do anything for the state of her soul. She stopped digging a moment, and listened. She just made out the sounds of the blob pushing into the tunnel. Amanda smiled, and made a left turn. This part was going to be easy. She had done it several times during the tunnel wars in Nam. Granted, when they expected her to be a tunnel rat, they didn’t realize that she could turn into a rat, though she rarely used it. It was tempting to use it now, but it would take too long to dig this tunnel at speed as a rat. Amanda pushed on, circling the blob’s original catacomb. She could have circumvented it entirely, but that would only put the creature on her tail. At current rate of speed, it would have put her between a rock and a squishy place. Amanda punched through the final bit of wall, then pulled herself out. She saw the back end of the blob pulling itself through the initial hole. She grimaced, reached for one of the vials in her pocket, and tossed it for the blob. Unlike the ones with holy water, this one was topped with a blasting cap. It was a simple solution of Styrofoam mixed with gasoline. It worked very well against vampires. But then again, it was basically napalm. The back end of the blob burned away, and what was left withdrew into the tunnel as the hole filled with fire. The blob only had one other way to go, and that was right out of the hole she came from. Amanda went for the cell door she had thrown at the blob earlier. It was relatively intact, having been left behind when the blob came after her. She grabbed the metal door, ripped it in half, and quickly beat one edge flat. Amanda got back to the hole just before the blob started to push its way through. She waited until a foot of blob came through, then quickly flipped the piece of blob into the fire she started in the other room – a fire that had spread to the bed she woke up on. Thankfully, what the blob had in size, it made up for by being seriously stupid. It kept coming, and each time she would slash off part of it with her piece of door. She had considered going after it with her sword, but she didn’t want to know what long term exposure to this thing would have done to it. I suspect I will need it if I have to kill something after this. Dig its own path out. Amanda tossed her half of the door to the other side of the room, and dashed for the initial hole. Along the way, she swept up the other half of the door. She kicked the bed to one side of the room, bent the four corners of the door half to 90-degree angles, and used them as nails to pound it over the opening, sealing it in that way. She wouldn’t need the fiery bed elsewhere. She grabbed the bed by the legs, and pulled it into the catacomb just in time for the blob to burst through the wall. And that’s when Amanda tipped the burning mattress right on top of it, setting the whole thing on fire. The blob thrashed, and roared, and couldn’t decide where to go to get away. Every time it tried, Amanda was there, the sharpened door edge hacking away. Five minutes later, Amanda took a slow, deep breath, watching as it evaporated into nothing. 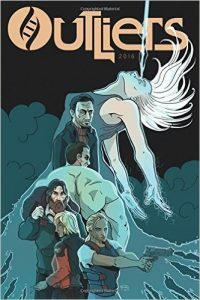 Brian Niemeier is the Campbell Award nominated author of the Soul Cycle series, including the Dragon Award nominated Souldancer. 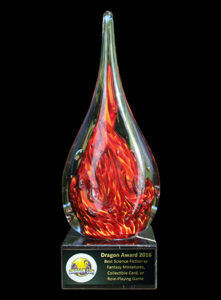 He graciously agreed to enter this Author Gladiatorial Challenge to earn your vote for the Dragon Awards. The awards have passed and Brian has won, but the challenge continues! You can find his entry for round one here. Below is his entry for round two. I hope you find it as entertaining as I did. Declan’s entry will run later this evening, with judging to come tomorrow. Astlin isn’t entirely clear as to whether the approaching cube is real or another violent hallucination. One thing is clear, though: the cube. There are all sorts of odds and ends floating inside it. One item in particular catches Astlin’s attention. It’s a stop sign. Is a stop sign still legally binding when it’s inside a gelatinous cube? Probably not. Then again, what if the cube isn’t really a cube at all? What if it’s a school bus? You can get in big trouble if a school bus puts its stop sign out and you don’t stop. Astlin has been staring at the stop sign for a good five minutes, weighing the pros and cons of ignoring it or not, when she is enveloped by the cube. Five more minutes pass before she stops staring at the sign and realizes that she’s inside a ten by ten by ten foot cube of warm gel that’s oozing its way down the corridor. The jelly is in her ears, crackling like a wet plastic bag. It’s pretty nice in here. She’d forgotten how much of a chore it is lugging her brass body around. Floating inside the cube makes her feel practically weightless. It’s like drifting on a cloud–a warm, sucking, cube-shaped cloud. Astlin can understand how being inside a gelatinous cube might not be everybody’s thing. Most other people have to breathe, for one. But that’s no problem for her. The gel itself also seems like it’s pretty corrosive, if the rapidly dissolving rats in here with her are any clue. That’s okay. Her armor can shrug off black dragon breath, so the cube’s acid gel won’t eat through the salamander leather, and it just makes the exposed skin of her face tingle. Snug as a cherry in the center of a Jello mold, Astlin lies back, relaxes, and goes where the cube goes. Three hours later, the cube finally gets tired of carrying Astlin’s weight and disgorges her from its bulk. She sits on the tunnel floor for a while, unhurt but soaking wet. She decides to take her armor off and dry it with her body heat. Upon removing her shoulder-length right glove, Astlin is shocked and delighted to find that her brass flesh has been polished to a mirror shine. The gel must have eaten away the dull buildup that accumulated over the years. Seriously, below the neck she looks like a brand new award trophy or a luxury car hood ornament!